The per­fect bicy­cle must be bal­anced. It must be made to fit you, not the other way round. 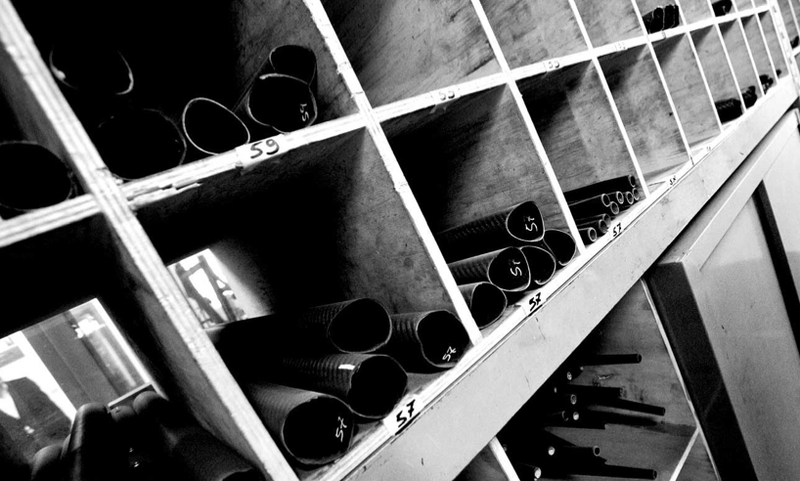 That’s why we make as wide a range of sizes as pos­si­ble of our frames, with 22 off-the-peg sizes in our C59 Italia and the option of cus­tom fit for rid­ers with spe­cial requirements. Balanced han­dling is vital too. 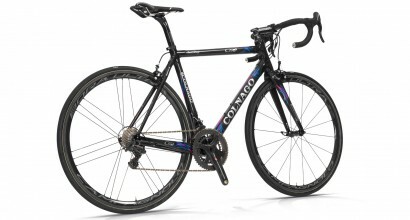 Colnago invented mod­ern bicy­cle rac­ing geom­e­try and has refined it to per­fec­tion with han­dling that is unwa­ver­ingly accu­rate but sta­ble at speed, so a long day in the moun­tains is a bat­tle against the gra­di­ent and your rivals, not against a twitchy bicycle. 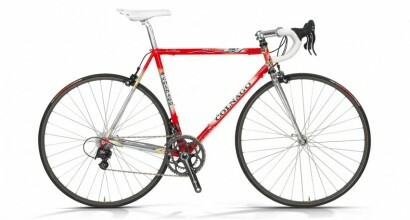 Colnago ride qual­ity is rooted in the idea of bal­ance too. A frame must be stiff, to con­vey your power to the road, but it must not be harsh. Features like our 3PRS internally-ribbed tubes and over-sized chain­stays with leaf-shaped seat­stays simul­ta­ne­ously improve rigid­ity and dis­si­pate road shock. Frame integrity is a cru­cial aspect of Colnago design. Our frames and forks are tested in the Colnago Lab to with­stand impacts far beyond inter­na­tional stan­dards, and to retain their strength after impact. 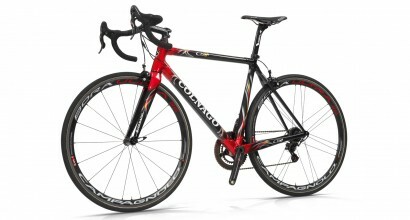 That means your Colnago can still be rid­den to the fin­ish if the worst happens. We’re always look­ing for ways to improve our frames. New ideas start with Ernesto Colnago’s sketches, and then computer-assisted design, finite ele­ment analy­sis, and rapid 3D pro­to­typ­ing allow us to test new ideas in days. Tomorrow’s Colnagos are already on the draw­ing board. 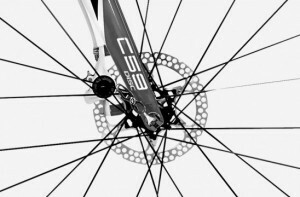 WHY DISC BRAKE VS RIM BRAKE? 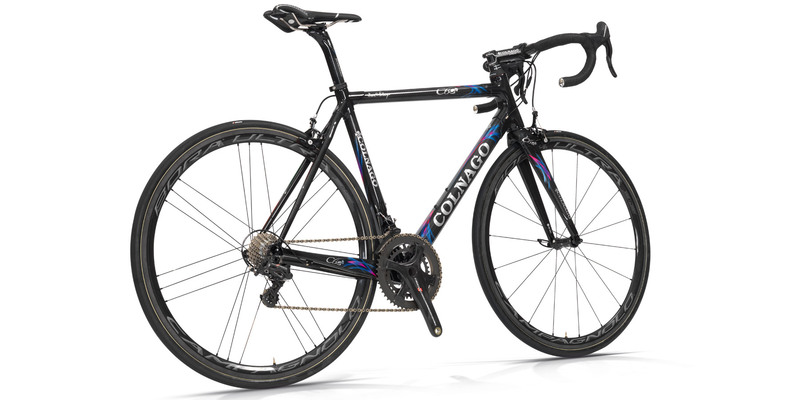 Colnago’s disc brake fea­tures: higher piv­ot­ing, speed-lock avail­able (inter­nal rout­ing), wide range of lever reach adjust­ment, fin­ger clear­ance on top posi­tion (fore­fin­ger can hold the grip). 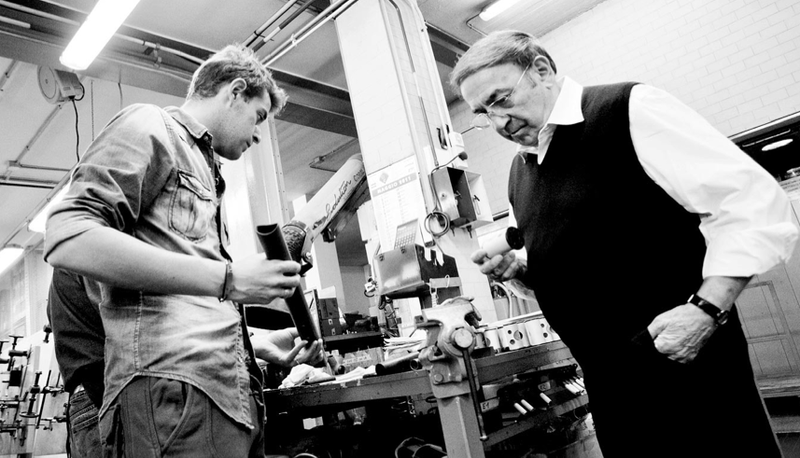 Colnago was the first frame builder to see the poten­tial of car­bon fibre in the evo­lu­tion of the cycling. He chose to match the lat­est tech­nol­ogy with the con­cept of cus­tom geom­e­try frames. Muscular exten­sion, flex­i­bil­ity and per­sonal pref­er­ence for posi­tion com­bined with aer­o­bic and ped­alling effi­cien­cies are too many vari­ables for a rider to be locked into the con­fine­ment of only a few frame sizes. 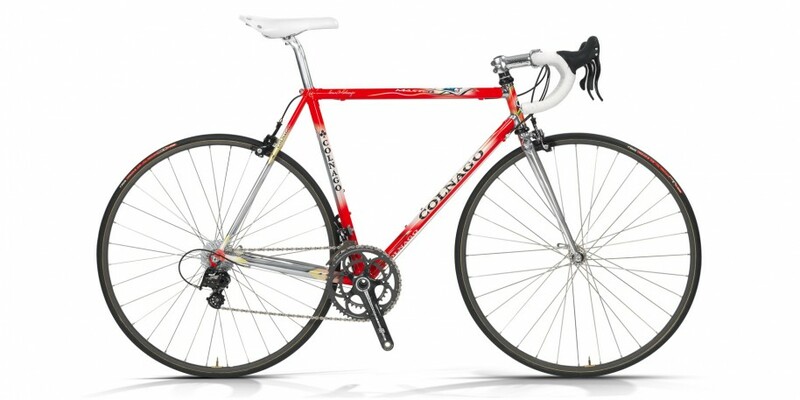 This is why all the top Colnago frames offer lugged con­struc­tion to fit all rid­ers. 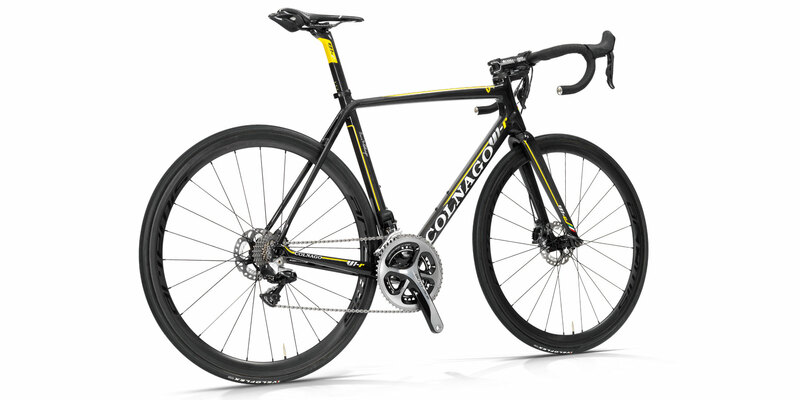 Whether for one of the 130 Colnago-sponsored pro­fes­sional cyclists or one of the mil­lions of demand­ing ama­teur rid­ers around the world, there is a Colnago that offers the per­fect fit. 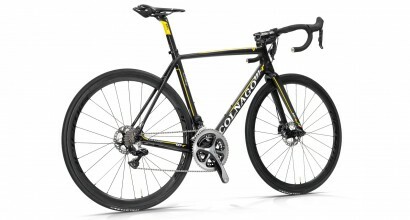 With this con­cept, Colnago takes age-old crafts­man­ship into the future. Even with the vast avail­abil­ity of car­bon fibre, there are a num­ber of poten­tial prob­lems that can exist in the man­u­fac­tur­ing process. 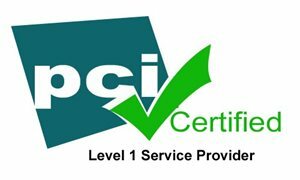 Only with great invest­ment in man­u­fac­tur­ing tech­nol­ogy can a car­bon prod­uct be con­sid­ered safe and reli­able with no sac­ri­fice to per­for­mance. 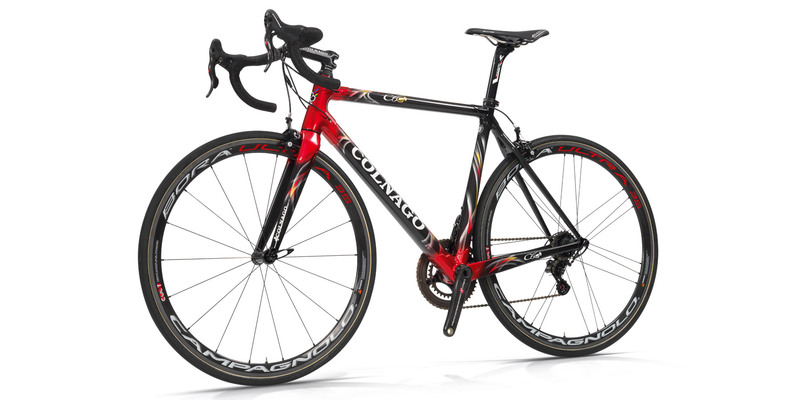 The tubes of Colnago frames are built with an advanced fil­a­ment wind­ing sys­tem. This process, which is per­formed over a solid, stain­less steel INOX core, yields a highly con­sis­tent wall thick­ness, even in cases where the tubes use intri­cate exter­nal and inter­nal shape and struc­ture. Moreover, thanks to the INOX “mir­ror treated” cores, all the dif­fer­ent lay­ers are com­pressed with extremely high pres­sures. This advanced process lim­its excess resin in the com­pos­ite, reduc­ing weight while increas­ing strength. This, plus advanced tube shap­ing and struc­ture, yield the high­est strength to weight ratio.